Middlesbrough’s Under-21s went down to a 3-1 defeat at Walsall in the Checkatrade Trophy Northern Group E last night. The Saddlers started well and Kieron Morris forced a fine save from Andy Lonergan in the second minute. Home skipper Luke Leahy went close with a drive from outside the box as the home side pressed for an early breakthrough. The opening goal came after 25 minutes when Jack Fitzwater netted with an athletic strike on the volley from 18 yards. Lewis Wing went close for Boro, but Walsall doubled their lead on 31 minutes when Maz Kouhyar turned in a free-kick. Boro’s youngsters had a good spell of possesson but could not get a goal back before half-time arrived. In the second period, Harry Chapman fired over from 20 yards, and Wing also went close. Chapman had to be replaced just after the hour with what looked like a hamstring problem. Boro pulled a goal back through Dan Ward who fired home from inside the box, after a determined run from Kian Spence. Wing and Ward both shot wide as Boro looked to level things up. However, two minutes from time, Andy Cook blasted a superb shot from outside the box past Lonergan to seal the win. Meanwhile, first-team manager Tony Pulis says everyone must pull together at the club to keep their promotion push going. Boro slipped to fourth place in the Championship table at the weekend after a 2-0 defeat at home to Nottingham Forest, but remain just three points behind leaders Sheffield United. 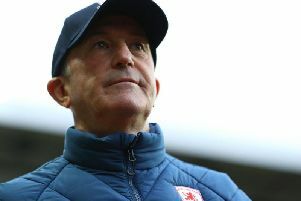 Pulis says there will be other dips in form and results over the course of a long season, but has backed the squad and backroom staff to stay united. “You need everybody together and doing the right things, and if they’re not happy, you’ve got to sort it out,” said Pulis. “You’ve got to make sure it’s done in the right way. “Let’s be fair, we will fluctuate. We’re not that good to go through a season continuing doing what we’re doing. You’re going to go up and down, so you need everybody to understand that.